[Solved]How to export bookmarks in Opera 43? How do I export bookmarks in Opera 43? According to this website, it's supposed to be there. But I don't see anything. Can anyone assist here? Would like to use Opera as my regular browser. There is no export tool in Opera, you need to find an extension that do it. So, I don't know where you are getting that "it's supposed to be there." There should be a way to backup bookmarks (export, which opera 12 had, extension .adr). You can backup any data of any program on your computer without needing to rely on the own programs to do it. In the case of Opera, just backup its profile folder. You can drag and drop bookmarks and bookmark folders from Opera to Chrome directly, but you cannot do the reverse. So you could drag your bookmarks to Chrome and then save them to an HTML file from Chrome. What I mean is that all major browsers (including the infamous IE) have an option to export bookmarks (to save them or to import to other browsers) including opera 12, so, the not so new now opera should have this option. Just saying. Is somebody blocking Opera's advance¿? 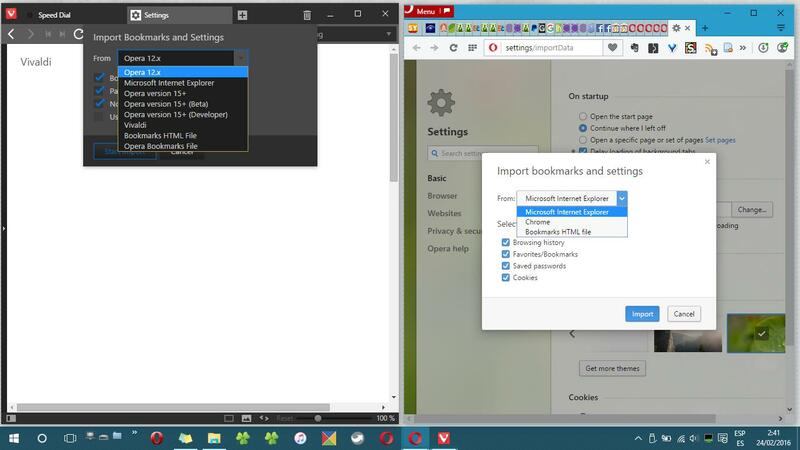 Idem for export Bookmarks, Vivaldi has the option, Opera not. There is no in-built option in opera to export bookmarks. But that was for older versions. From opera version 47, we have an option to export bookmarks directly. No Need to install any extensions / add-ons or third party apps. Just update your browser to the latest version and from the "SHOW ALL BOOKMARKS" page, you can export the bookmarks to .html file. However if you want to stick with the older version and want to export the bookmarks, I suggest you to check out this article to Export opera bookmarks to chrome, Firefox or any other browser.